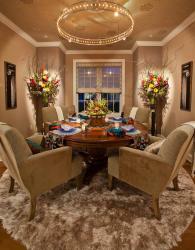 Dining Room designed by Bill Miller, photo by Bryan Barger. Artwork (left to right): two Column Photos by Bryan Barger; two Sculptured Floral/Pedestals by Stuart Sacks; Centerpiece, Chargers, Bowls and Martini Glasses at Hudson Beach Glass. Last fall, international glass artist Barbara Galazzo was considering how to create more exposure for Hudson Valley artists. Following the momentum she’d created with the first, hugely successful, Cold Spring Arts Open Studio Tour, she hit upon an innovative way to benefit several diverse groups. Her idea grew into the ArtFull Living Designer Show House—a unique collaboration between seven award-winning designers and 30 artists at Glassbury Court in Cold Spring. Many of the artists, like me, were selected by more than one designer and exhibited more than one piece. I’m writing to share my experience as it relates to those designers and their different approaches, the rooms my paintings are in, and the other artists in those rooms. Award-winning designer Bill Miller “sculpts space.” He sees architectural structures and envisions how to make the spaces come alive and dance. I was impressed that Bill saw the structural shapes of the three rooms he’d been chosen to design—Living Room, Dining Room and Kitchen—as geometric forms unto themselves. What I saw were the details: open flowing spaces, lovely white columns giving grace and style to the interior, and large light-filled windows. Seeing the rooms as straight-edged, six-sided shapes (including ceilings), Bill decided to activate the architectural squares and rectangles with curves and circles in counterpoint. For example, in the Dining Room, three concentric circles crown the room in invisible tiers: a chic circular contemporary chandelier hangs above a large luxurious circular table, atop an even larger silky round rug. Living Room designed by Bill Miller, photo by Lori Adams. Art work above/on mantle: Mixed–Media by Angelo Marfisi (center); pair of encaustic paintings by Barbara Smith Gioia; orange glass sculpture by Marty Kremer at Hudson Beach Glass; three candlesticks by Chip Schwartz. Floor clockwise from left: wood and metal console table by Studio 9; glass installation under mantle by Barbara Galazzo; small wood steel and glass Poe table (bottom) and glass, marble and metal cocktail table (center) both by Eric David Laxman; orange and black glass sculpture on table by Vitrix Glass at Hudson Beach Glass. 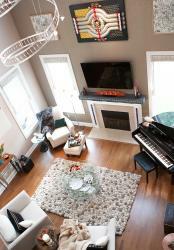 Bill accentuated the Living Room’s soaring ceiling with a soaring spiral chandelier (also chic and contemporary). Carla Goldberg’s piece de resistance, a 6-panel piece (8x6 feet) sets the aesthetic bar high: in another stratosphere. To me, her ethereal work is air and water. Constructed of resin,—clear like air, or frosted like ice on windowpanes,—her imagery flows from panel to panel like waterfalls. Her sense of playfulness is evoked in the bubble shapes containing cutout images of Lady Gaga’s shoes, as homage to that iconic, often-champagne-blonde talent. The bubbles encompass a magical world much like snow domes of my youth. From Carla’s elegant piece, serenity pervades the room. The bluestone-colored mantle above the fireplace acts like a horizon line: water below, air and sky above. Below, Barbara Galazzo’s aquamarine glass pieces— with undulating circles like air bubbles rising through water—frame the fireplace. Above, Angelo Marfisi’s quicksilver showstopper piece simultaneously creates a resting place and winds up the square-versus-circle dance Bill has choreographed. Beside Angelo’s piece float two poetic paintings by Barbara Smith Gioia. Her lyrical black lines sing on white fields with hints of blue—arias to clouds and zephyrs! my painting represents fire. Bill has ignited the classical elements of air, water, earth and fire to dance—from left to right—around the room. Clearly, he understands how point and counterpoint work in a deeply compelling way! Master Bedroom designed by Chuck Burleigh, photo by Lori Adams. Artwork by: Site installation of hand-drawn lines and framed drawing by Jaanika Peerna; three ceramic figurines by Ada Pilar Cruz. In the adjacent rooms—the Master Bedroom, Hallway and Master Bath—designer Chuck Burleigh conjures an altogether different aesthetic experience. First, the bedroom was painted all white until the room became a fresh white canvas—a literal white box. 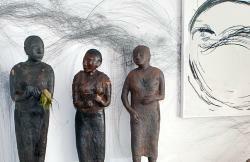 Then, Jaanika Peerna drew— with pencils—her flowing gestural marks directly on the white walls. Her curved lines impart the joy of Matisse’s Dance. The white room covered in elongated black lines looked like a work of art to such an extent I worried that adding anything would detract from the room’s artistry. However, I need not have worried. Chuck had a vision. He hung Kaija Korpijaakko’s luminous white-and-black multi-tiered cylindrical chandelier from the ceiling, added Jessica Wickham’s outrageously handsome planks of black walnut for a headboard and bed frame, and placed three of Ada Pilar Cruz’s mysterious clay figurines to stand silent as sentinels. Chuck himself made a twig lampstand. Each addition enhanced the room. When I shared my experience of these rooms with Cabot Parsons, a friend, fellow artist, and regional arts developer, he immediately said, “Oh yes! For me, Chuck’s rooms demonstrate what happens when the art is the environment. Cabot’s description clicked. I knew just what he was talking about! Master Bathroom designed by Chuck Burleigh. 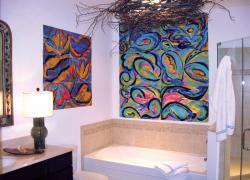 Artwork by: Two paintings by Imogene Drummond; lamp shades by Kaija Korpijaakko; twig chandelier by Chuck Burleigh. “Yes,” Cabot continued, “You continue deep into the forest, then suddenly enter an opening and plunge into a refreshing pool of steaming water that are your lush blue paintings in the spa-like bathroom! Because your two large paintings have been configured to practically fill up two adjacent walls, they create the aquatic environment in that room, so the whole room becomes a rejuvenating pool of water. And Kaija’s lampshades that look like light on poured water, and Chuck’s twig chandelier complete the setting.” Well, I hadn’t thought of Chuck’s rooms that way before, but I’ll never be able to think of them any other way now! For Cabot, the ArtFull Living Designer Show House demonstrates the astonishing dynamism that can result when art is integrated—or activated—as the environment. Previously, I’d simply thought the exciting collaboration between the designers and artists at Glassbury Court had ignited an explosion of creativity. Well, clearly, it had! Now I understand why. The ArtFull Living Designer Show House at Glassbury Court is located at 3370 Albany Post Road/Route 9, #3 Yesterday Drive, Cold Spring. It has been extended through Oct 14, 2012. It is organized by Barbara Galazzo and sponsored by ArtFull Living, Cold Spring Arts, Garrison Art Center and Glassbury Court. For more information, please call 914-815-3133 or 845-265-9600.